Wood burning is the leading cause of wintertime pollution in the Bay Area. The Air District bans wood burning on days when pollution is expected to be unhealthy and Winter Spare the Air Alerts are called. The nine counties that surround San Francisco Bay are home to almost seven million residents and an estimated 1.4 million fireplaces and woodstoves. The particulate matter, or PM, in wood smoke from these fireplaces and woodstoves has been a health concern in the Bay Area for many years. Under certain meteorological conditions - cold, stagnant winter evenings - surface based radiation inversions form quickly in the Bay Area and PM levels rise rapidly. By the 1980s, wood smoke became the largest area-wide stationary source of PM in the Bay Area. Studies by the Air District indicated that wood smoke was responsible for an average of one-third of the PM in the air basin during the winter months and almost 70 percent of the PM in Santa Rosa. Wood burning also generates carbon monoxide and toxic air pollutants such as benzene and dioxin. Since the 1980s, many scientific studies have been published that correlate rising PM levels with serious health effects, such as asthma symptoms, decreased lung function, increased hospital admissions, and even premature death. The U.S. Environmental Protection Agency (EPA) has set a national PM emission standard for woodstoves at 7.5 grams per hour. Since July 1, 1990, all woodstoves manufactured in the United States have been required to meet this EPA standard. Previously, unregulated woodstoves averaged 60 grams of PM in an hour. Switch to a Gas Fireplace or Insert: Convert your fireplace to gas with a new gas fireplace insert. 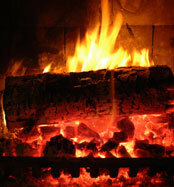 If You Must Use Wood, Burn Less Wood: Reduce your heating needs by weatherizing your house. Replace your old woodstove or fireplace with a new certified model, and get more heat and less pollution while burning less wood. Change the Way You Operate Your Stove or Fireplace: Burn only clean, seasoned wood and non-glossy white paper. Build small, hot fires instead of large smoldering ones. Burn seasoned cordwood. Watch your chimney for smoke and have it inspected often. Follow your wood heater's operating instructions carefully. And Remember - It's Illegal to Use Your Fireplace or Woodstove when a Winter Spare the Air Alert has been called.